Small group Bible studies form the core of GCF. 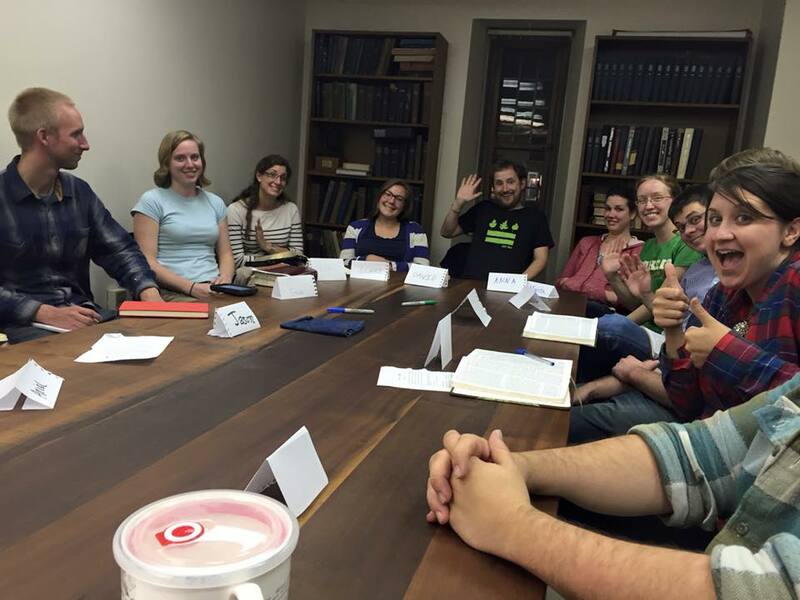 During one of these weekly meetings, we typically have a Bible study, worship, and prayer. Each semester we organize three studies on different days of the week. Read more about the current studies below. This semester we’re going through the Sermon on the Mount. We will be using John Stott’s commentary and Bible study notes. Contact Jessica Price or Joe Welklin for details on the location. Let’s face it, Judges is a tough book. But the redeeming story that follows of Ruth is a great one to get us through the semester. Join us for our winter study that will last 4 weeks. Contact Jessica Price or Joe Welklin for details on the location. This Fall we’re going through the book of Judges, chapter by chapter and wrestling with some of the tougher themes in the Bible. Contact Jessica Price or Joe Welklin. This is the “first-year study” in that it is a great opportunity for incoming graduate students to meet each other and more senior students at Cornell. That said, first-years can attend other studies, and you don’t have to be a first-year to attend this one! We’re looking at Galatians and Thessalonians, using a book by Tom Wright: Paul for Everyone, to guide us through these epistles. The book is clearly written and easy to understand and does an awesome job of giving you both background on the history of the time and putting Paul’s teachings into perspective for modern times. The chapters are short as well so it’s not a big time commitment at all. We’re reading and discussing C. S. Lewis’s book Miracles. messianic allusions and/or prophecies in the Psalms. This is the “first-year study” in that it is a great opportunity for incoming graduate students to meet each other and more senior students at Cornell. That said, first-years can attend other studies, and you don’t have to be a first-year to attend this one! This semester we will be going through the life of Solomon and the book of Ecclesiastes. It will be a great opportunity to look at God’s plans for our lives and wisdom in general. This is a historical study on the relation between religion and science. We’ll loosely follow the book Origins: Christian Perspectives on Creation, Evolution, and Intelligent Design. Tuesdays – 7 p.m., 115 The Knoll. We’ll be working through (parts of) Dante’s masterpiece Divine Comedy. We’ll focus on how the Comedy is still relevant today. A brief summary will be posted soon! The Monday night Bible study, alias “The First Year Study” will be studying the book of Philippians this semester. We’re going to use D.A. Carson’s “Basics for Believers” to learn about Paul’s instruction on consistent integrity and the cross as the center of life, melding exposition and application approaches. James: It’s easier to read than Paul! Please join us for a study through the epistle of James! We’ll follow the author’s main points through this blunt and practical letter. This study will be looking at formative events in early church history. What did the church look like in the past? How has it changed? How is it the same? Tuesdays – 7:30pm, Chesterton House. Mondays – 7:30pm, Anabel Taylor Hall; One World Café (Sept. 6 19 and 23). After that, it will be at 107 Oak Hill Place. People of the Covenant is a highly accessible and fascinating introduction to the Old Testament that reveals the text as anything but old. Join us for a chance to explore the text through the lens of the people who populate it, including the history and relevance of ancient Israel. Our goal is to give an overview of the whole “First Testament” in the fall semester, with plenty of discussion and points for practical application of our topics. – Dianne Bergant, author of People of the Covenant; An Invitation to the Old Testament. Designed with first year grad students in mind, but all are welcome! Note: on Tuesday, Nov.5, the study will be held at 7pm at Esther and David Taylor’s place (map). Tuesdays – 7pm, 607 Winston Ct #5. A topical study looking at the attributes of God; what it means that we are made and being restored in His image and which attributes of God we can and cannot reflect in our lives. Join us as we discuss not just the bare bones of His attributes, but also why He made us and how this directly relates to the gospel. Tuesdays – 7:30pm, 115 Linn St, Apt. 1. The book of Genesis has some of the most recognizable stories in the Bible, but there’s a lot more going on under the surface. Join us as we delve into the creation, fall, and beginnings of redemption for humanity and God’s chosen people as we discuss what these stories tell us about God and what they mean to us in the context of history and our lives today. This study will be going through the gospel of John, taking turns leading a chapter each week. This is a good opportunity to practice your skills in exegesis! Contact Marita Wilson or Colin Ponce for more information. This study will be taking a look at the synoptic Gospels: Matthew, Mark, and Luke. Specifically, we’ll be examining the stories which appear multiple times in the Gospels. How are they different, and why? What is the common thread amongst them? Contact Matt Farrar or Greg Hallenbeck for more information. This study will be looking into Israel’s history in the Old Testament by examining the revelation of God, the character of His people and the context of the prophets. This study will be taking a look at the lives of some of the Old Testament Prophets and their teachings. The study is designed especially to help first year graduate students plug into Christian community, but anyone is welcome to attend. Contact Marita Wilson or Colin Ponce for more information. With so many examples around us, what does Christian morality look like and which Biblical passages found our understanding of morality? This study will seek to answer this and related questions. Contact Matt Farrar or Greg Hallenbeck for more information. Where do we get our ideas about sanctification? Come see how Paul’s second letter to the church at Corinth shapes our understanding of sanctification and find out how this understanding of sanctification impacts our lives today. Contact Kyle Wilson, Andy Bragg or Hannah McConnell for more information. We will be studying Colossians and particularly considering Paul’s instruction in light of the Roman empire of his time, and then considering how a similarly counter-cultural modern Church and Christian life might best embody the gospel. Contact Stephen Thompson or Paul Simonin for more info. We will be considering the perspectives of various prominent atheists as presented in The Portable Atheist, and discussing how these thoughts align with Christianity’s understanding of truth. We will consider how followers of Jesus might craft a gracious response to questions raised by new atheism. Contact Michelle Tong or Matt Farrar for more info. We will be reading and studying Proverbs, loosely following the LifeChange Bible study guide. For more information, please contact Brad Westgate or Jon Steffens. This study will explore current topics which are requiring careful discernment by the church. Members will take turns presenting the various stances held by modern Christians on a hot topic, or highlight modern Christian perspectives that differ significantly from secular perspectives. For more information, please contact Stephen Thompson or Paul Simonin. This study is designed especially for first-year students or new members of the Cornell/GCF community, however all are welcome to attend! The study will explore four foundations of Christian practice and discipleship: Spiritual formation, integration of faith & learning, Christian witness and service, and Christian community. Members are welcome to come and learn, share their experiences and connect with other new members. For more information, please contact Christian Guzman. This study will focus on the topic of obedience. What commands (New and Old Testament) are we called to obey, and what should we do specifically to follow them? The study will also focus on praying for each other and building fellowship and accountability in our group. The study will start off with a discussion of the “new commandment” from John 13:34. For more information, please contact Brad Westgate or Jon Steffens. We explored the book of Isaiah in light of its Biblical historical context and its impact/relationship with the New Testament. We particularly sought to gain a clearer picture of God’s redemptive work in the world and our place in that process. Why did Jesus tell parables? What did they mean to his original audience, and what do they mean for us? We discussed what makes the parables distinctive and what they have to say about living as a disciple of Christ. We began by studying some parables and parable-like passages from the Old Testament, informing our perspective on the parable tradition that Jesus took up and used in new ways. Since parables bring difficult spiritual or theological messages into the language and matter of everyday life, we also discussed on a very practical level how these parables apply to our own lives. We studied and practiced the spiritual disciplines. Geared toward helping first year students steer through the busyness, we aimed to build an encouraging community where people were heard, prayed for, and challenged to grow in their love of Christ. Our study of the spiritual disciplines, such as prayer, journal writing, and stewardship, served as tools for enhancing our spiritual walks.